A 58 yo male presents to the emergency department with an 8 hour history of diplopia. He has no past medical history, has no allergies and is on no medications. He denies any recent illness or trauma. Recently a great journal article was brought to my attention and I thought everyone should hear about it. It outlines the investigation approach, in the emergency department of the patient with diplopia. The paper in question is Margolin E et al. 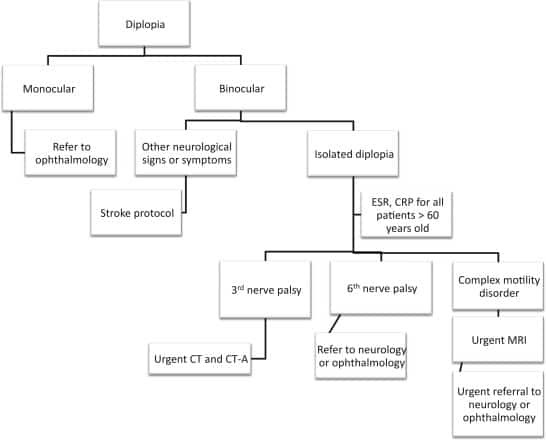 Approach to a patient with diplopia in the Emergency Department. J. of Emerg Med. June 2018. Volume 54, Issue 6, Pages 799–806. Here is the summary of the approach. The approach asks 5 questions, which allow a decision to be made. It mainly refers to adult patients. My approach with children would be that any binocular abnormality, would probably require an MRI to ensure there is no compressive lesion. IS THE DIPLOPIA MONOCULAR OR BINOCULAR? Monocular diplopia persists when either eye is closed, whereas binocular diplopia resolves when one eye is covered or closed. Monocular Diplopia is not due to cranial nerve abnormality but due to refractive error or something similar. Investigation with CT scan is not required and the patient should be referred to an optometrist/ophthalmologist. Binocular Diplopia is due to cranial nerve III,IV or VI being affected, thus affecting the movement of extraocular muscles. The cranial nerves can be affected within the orbit or intracranially. Beware the patient with diplopia and other neurology, as this is likely to be a stroke. Look for symptoms such as vertigo and aphasia and dysphagia, and also signs of ataxia and motor or sensory deficit. Patients with any symptoms need an MRI scan to exclude a stroke. WHICH CRANIAL NERVE IS AFFECTED? If this is recent in origin, it is more likely due to micro-ischaemia and the patient can usually wait to be seen by a neurologist as an outpatient. Also if it is bilateral, it may be due to raised intracranial pressure. 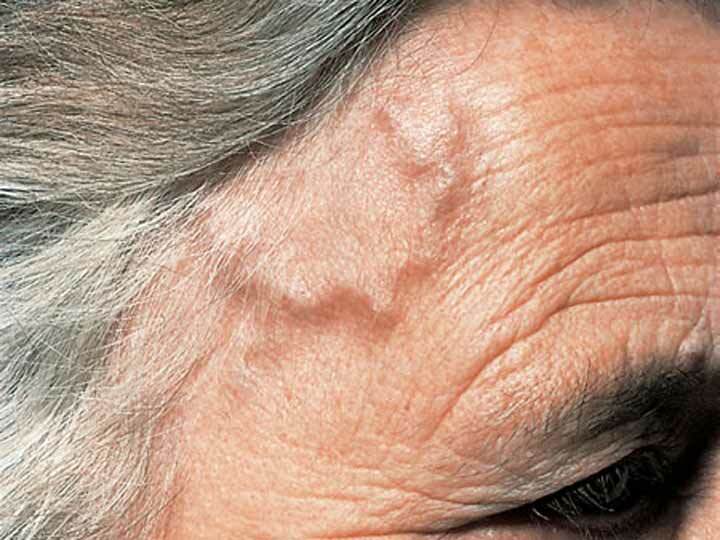 Look for papilloedema and perform an MRI the patient. Almost normal examination and difficult to pick. The patient may have a vertical or oblique diplopia and may tilt their head to resolve the diplopia. This is most likely due to trauma or decompensation of a congenital palsy. These patients need to be referred to a neurologist as an outpatient. Cranial nerve III controls eyelid, pupillary response and most movements of the eye except those caused by IV and VI. I will say that any CN III abnormality requires CT and CT angiogram to look for a cerebral aneurysm. IS THERE MORE THAN ONE CRANIAL NERVE INVOLVED? When there is a suspicion that the motility disorder is secondary to more than one cranial nerve, these patients require an MRI as there may be a cavernous sinus lesion, or an orbital issue. IS THE PATIENT > 60 YO? Margolin E et al. Approach to a patient with diplopia in the Emergency Department. J. of Emerg Med. June 2018. Volume 54, Issue 6, Pages 799–806.